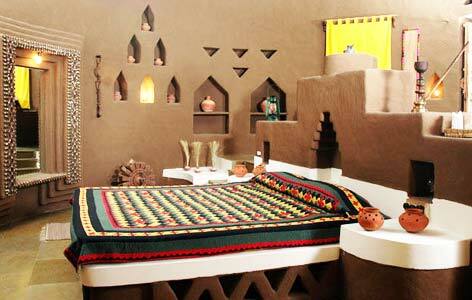 "Fashioned like a Rajasthani village the Desert Resort is not a hotel, it is an experience. Capture the true essence of rural Rajasthan in this heritage hotel in Mandwa town of Shekhawati while exploring royal Rajasthan. The Desert Resort in Mandawa was one of the pioneer structures in the mud architecture and was constructed in 1985. The resort was the creation of Thakur Kesri Singh, who created this resort as an extension of his hobbies. Even today one can see his excellent collection of vintage cars or enjoy playing billiards, relish the camel and horse ride and savor bird watching at the oasis, especially created for the purpose. The cottage wonderfully represents the local culture and timeless traditions of the place. The Desert Resort was created by local villagers and craftsmen and wonderfully represents the harmony between the nature and the humans. 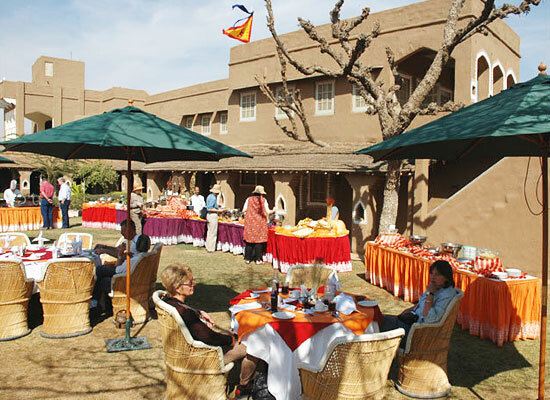 The Desert Resort has three exquisite accommodation options for their guests. There are in total 60 well-furnished, spacious and well-decorated rooms for the ultimate village resort experience for the guests. These are signature accommodations at The Desert Resort and are equipped with all the modern facilities in addition to being meticulously decorated. 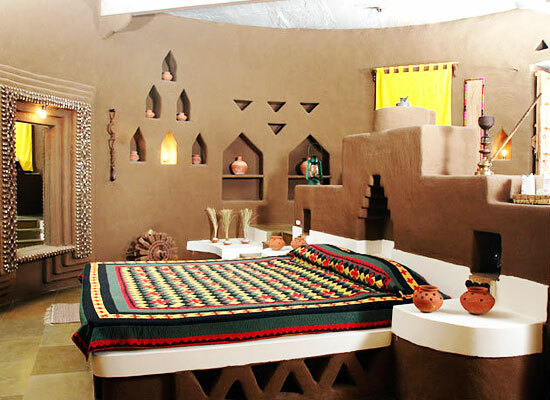 The cottages are graced with traditional lime-paste ‘mandana’ besides beautiful ornamental mirror work along with woven fabrics and handmade pottery. The rooms have air-conditioner, heater, refrigerator, comfortable king sized beds or twin beds with thick mattresses, separate sitting area and much more. The superior rooms are aesthetically designed and are bedecked with a fairly large bedrooms along with ample sitting space and fixed with all the important and state of the art amenities. Each room exudes a distinct character and are fashioned to provide maximum comfort and leisure to the guests. The sheer opulence and grandeur of these suites sets them apart, making them one of the best spaces in the resort to indulge in luxury. There is a separate living area, a grand en-suite bath with a tub, a separate shower area and a comfortable king-sized or twin beds. The Royal Suites also additionally contain a bar and a dining area as well. There is restaurant in the resort where guests can enjoy lip smacking dishes from Indian, Continental and Chinese fares. Meals are served in a buffet style under open skies where guests can fully treat themselves to the culture and local Rajasthani ambience. Shekhawati is a semi arid region in Rajasthan and encompasses many towns and cities. It is on the world map for its glorious and majestic forts, palaces, frescoes and mansions.